You shall love the Lord your God with all you heart and with all your soul and with all your might. After being commanded by God in Deuteronomy 6:4 to Hear! (to pay close attention to what I’m about to say), in the next verse we now hear what we are supposed to do in response. Let’s explore what God meant when he said to love him with all our heart, soul and might. First, we should point out that the reason the Shema has such a depth and breadth of meaning is the Hebrew language itself. Hebrew is what is known as a “poor” language because the whole language only contains about 8,000 words. In contrast, English has over 400,000 words! Because this ancient language has so few words, each word must necessarily have much more than one meaning. One writer described this phenomenon by saying that each word in the Hebrew language is like an overstuffed suitcase, bulging with extra meanings and when unpacked many delightful new interpretations pop out. Many verbs that we read in the text that we think of as only mental activity in English, in Hebrew are also calls to action. For example in Genesis 4:1 it says that Adam “knew” Eve. In English, we thinks of “to know” as only to understand. But, in the Hebrew, “to know” was to have a close relationship, to care for that person and even be sexually intimate. What was only a mental activity in English, was a whole set of actions in Hebrew. You can see from this example (and there are many others in scripture) that one word in Hebrew packs a much bigger punch. We’ll see this play out as we begin to look at the first word in chapter 6 verse 5, Ve’ahavta. Ve’ahavta – literally, “And you shall love”. At first glance it seems as if God is commanding us to have, what we think of in English, as an emotional feeling towards him. This is where the Hebrew word, ve’ahavta, again has a much fuller meaning. Love in the Hebraic definition is much more than the emotional high and feelings a person gets from worshiping God to praise music. Love of God in Deuteronomy is not only an emotional attachment or inward mental state, but something that expresses itself in action. Love, in the Hebrew, in addition to affection, also refers to loyalty, as in the loyalty of subjects to their kings or slaves to their masters. The command “to love” is here understood as requiring us to act and live in a certain way, a way that sets God’s people apart from all others. The book of Deuteronomy is very clear, you love God by keeping his commandments. We can’t love God just by mental feelings towards him, we must put them in action, just as we love our neighbor by the same process. B’khol and uve’khol – means “with all” , “and with all” and emphasizes undivided devotion, with everything that you have; total commitment. Levav – literally, “heart”. This refers to the center of your inner life. In Hebrew, heart doesn’t just describe your emotions, but your mind and thoughts as well. In Western culture, we locate our emotions in the heart and the mind and thoughts in our head. In general, Western culture tends to separate the mind from the emotions and in our Christian experience we often lean much heavier to the emotional side. We believe that worship and prayer are essential to our relationship with God, but take a much more casual approach to filling our minds with His word. Studying and memorizing scripture plays a much smaller role than prayer and worship. In Jesus’ time, to study and memorize God’s word was the highest form of worship. Great emphasis was put on memorization and education in the scriptures. To love God with all your heart does not only mean to worship him and pray to him, but to fill our minds with his words to us and dedicate all our mental abilities to him. Paul says it best in 2 Corinthians 10:5, “We take captive every thought to make it obedient to Christ”. Naphshekah – “nephesh” means “soul” or “ life and soul”. We are to love God with all of our lives. The opposite of this would be to love God with only a few hours out of our time on Sunday when we are in church. Often, the rest of our life is spent with the distractions of work, hobbies, sporting events and television, in which God has little place. There is nothing inherently wrong with any of these activities, but if we just put God in as an afterthought or just set aside a few hours of time a week for him, we are not loving him with our life and soul. 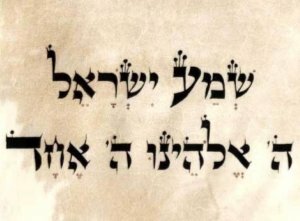 M’odekah – A Hebrew teacher once said that there are some word that no one should attempt to translate In Hebrew because the meanings is so rich that to translate it into one or two specific terms greatly diminishes its meaning. M’odekah is one of those words. Literally, it means, “with all your very” or “with all your muchness”, and also means “exceedingly”, “with much force or abundance”, and even “oomph”! Translators, faced with reducing it to a singe word use strength or might. It is almost always used as an adverb, like we would use, “very, very”, but in the Shema it is a noun. “With all your very” can also mean, “with all your increase”, and applies to our money, finances and possessions. We are to love God enthusiastically, earnestly, and with a zeal to please him in every area of our lives. By looking closely at the Hebrew meanings of the words that make up the Shema in Deuteronomy 6, we have greatly increased our understanding of what God is requiring of those who want to serve him. The last piece of the puzzle is the phrase that Jesus added to the Shema in the gospels. Next week we will look at the phrase, “And you shall love your neighbor as yourself”! M’odekah is now my favorite word. Great material and great Blog!! Thank you! What does God want us to be?…Be the message!! Isaiah 43:12b – “You are my witnesses,” declares the Lord, “that I am God”. If we live our lives by living Shema we are God’s witnesses!! !